We’re all wired differently, but we share some common wires. Every wiring harness I’ve ever seen – in electronics, cars, light switches or anything else – has a red wire and a black wire. Red is power. Black is a ground. It’s universally true. I’m not terribly sophisticated so my wiring harness likely has fewer wires than yours, but I’ll bet you we’ve both got a red wire and a black wire. Doubt, fear, procrastination. These are common wires shared by everybody. There are switches in our brain connected by these wires. When these switches get flipped, BAM! On comes the RED LIGHT. The tires on our life and our business squeal and smoke as we come to a screeching halt. There’s a signal light a few blocks from the church building where we worship. (Yeah, we always call them “stop lights,” don’t we? We never give people directions by telling them to go to the third green light or go light.) At any rate, a few weeks ago this light started staying RED a lot longer than it used to. I first thought it was hung. Traffic kept backing up behind me. We waited. We waited some more. No cars were coming from our left. No cars were coming from our right. Frustrated, I was ready to run through the intersection, but the green light appeared. 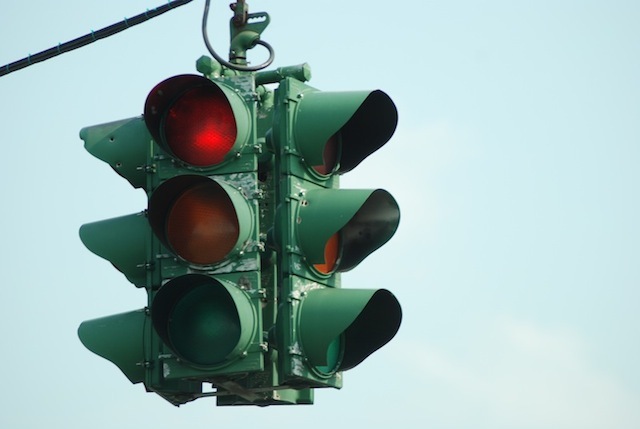 Sometimes in our lives – and in our businesses – we get stuck on a red light. We remain stopped until it turns green, growing more impatient. We seem to hit one red light after another. No sooner do we get a green light, accelerate up to full speed…until we hit another red light. One red light after another. It’s like all the lights have synchronized in a conspiracy to stall our momentum. The majority of today’s show is a discussion of three “drop dead, stupid simple” things that I think can help me – and YOU – move forward by giving us a GREEN LIGHT. I’ll end the show addressing that last special episode about the future of this blog, podcast and the videos. Chime in and tell me what you think. Thank you for listening. Won’t you drop by Apple iTunes and leave me a comment about the show? I wish you would. Or you can leave me some audio feedback at (214) 736-4406. I’d love to hear what you think. Previous post: Forget The Guy With Six-Pack Abs. Look At That Fat Guy!